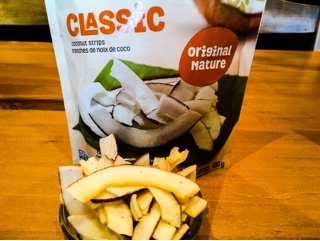 Even if you don’t enjoy coconuts, you may like the chips. It was a friend who first opened my eyes to these snacks about two years ago. At first, I wanted to pass; dry shredded coconut is an ingredient I still haven’t acquired a taste for. However, after one bite of the crunchy chip, I was hooked. Until now, the chips I’ve had were plain: essentially shavings of the coconut that are roasted until they’re dried and crispy. 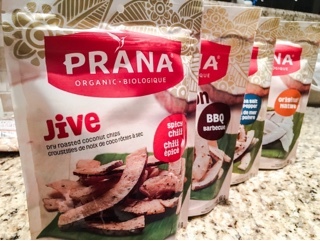 Much like Prana’s Classic flavour, although you taste the coconut’s faint natural sweetness, it’s still relatively neutral and there’s a lovely creamy finish on the tongue. 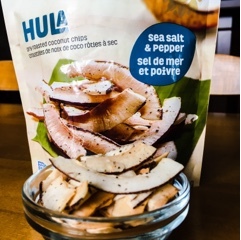 Hula – Sea salt and pepper flavoured, which makes an interesting sweet and salty combination with a kick at the end. For me, I found them a tad salty, but were the most reminiscent of actual chips. 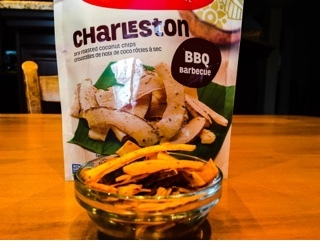 Charleston – A subtle BBQ seasoning with undertones of hickory smoke that’s mixed into the sweetness. Depending on the slice, you’ll also get a hit of spice to finish. Jive – My favourite of the three. Although it’s described as “spicy chili”, its heat was no stronger than the Charleston and noticeable as an after taste. The seasonings had a nice Cajun influence and an aromatic slightly garlicky scent. 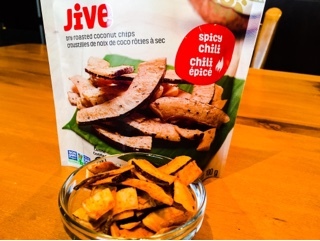 Like their other products, the chips are vegan, organic, gluten-free and GMO-free. So, although they provide the salty crunch I crave in chips, it’s a lot healthier. Plus, the product contains a lot of natural fats and fibre, so I’ve found I’m satisfied after a small palm full. Moreover, the hint of sweetness also keeps follow-up snacking at bay as after the savoury crunch, I’m not craving something sugary to round out the experience. 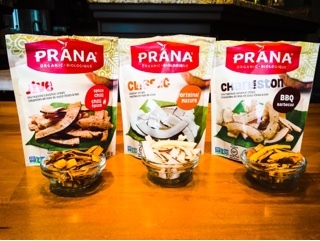 Prana named the line of coconut chips after popular dances from around the world, as a reminder for customers to just enjoy playing with their food. After all, snacking is fun; you shouldn’t feel guilty about the experience, just appreciate it! Disclaimer: The above snacks were provided on a complimentary basis. Rest assured, as noted in the mission statement, I would never promote something I didn't actually enjoy.